If I were to say that you freelance as [blank] consultant, what would be the word that fills that blank? Tricky question. “Freelance” is definitely the wrong word for it, since I doubt I’ll be taking on any more clients and the word obscures my current fascination with a self-directed life. It might make sense to use the word “independent” if we really need to contrast this with stable employment. Technically, I spend a fraction of my time consulting, and I can define the kind of consulting that I do in a compact phrase. But based on my 2014 numbers, that’s only 12% of my time. This is much less than the 37% of the time I spend sleeping, or even the 18% of the time I spend on discretionary projects or the 15% of the time I spend taking care of myself (not including the 7% of the time I spend on chores, errands, and other things). Since no one gets introduced as a sleeper even though that’s what we mostly do with our lives, maybe my discretionary projects will yield a neat occupational description for people who need to have that introductory phrase. Am I a writer (3%)? (“Author” is a smidge more self-directed and respectable, maybe, but I still don’t feel like I’ve written Real Books since all my resources are compilations of blog posts). A blogger? This is a category so large, it could mean anything. A sketchnoter (3%)? Alternatively: a sketchnote artist or a doodler, depending on whether I’m making it sound more respectable or more approachable. But the popular understanding of sketchnotes (if there is one) is that of recording other people’s thoughts, and I’m focusing on exploring my own questions. An Emacs geek (2%)? Too obscure; it doesn’t provide useful information for most people. Maybe an open source developer, which also includes the 1% of the time I spend coding – but I do more writing about software than writing actual software or contributing to projects. An open source advocate? But I don’t push it on people or try to change people’s minds. In the rare meetups I go to, I usually mention a bunch of my interests (drawing, writing, coding, experimenting), and people pick whatever they’re curious about. But most times, I try to preempt the “What do you do?” question with something more interesting for me, like what people are learning about or interested in. It’s so much easier when someone recognizes me from my blog, because then we can jump straight to the interests we have in common. Of these goals, I like the third (interesting conversations) the most. I can accept convention and pick one aspect of what I do, especially if I tailor it to their interests. For example, at a business event, I might introduce myself as a social business consultant who helps really large companies improve internal collaboration through analytics and custom development for enterprise social network platforms (well, isn’t that a mouthful). At visual thinking events, I might introduce myself as a sketchnoter focusing on exploring my own ideas. 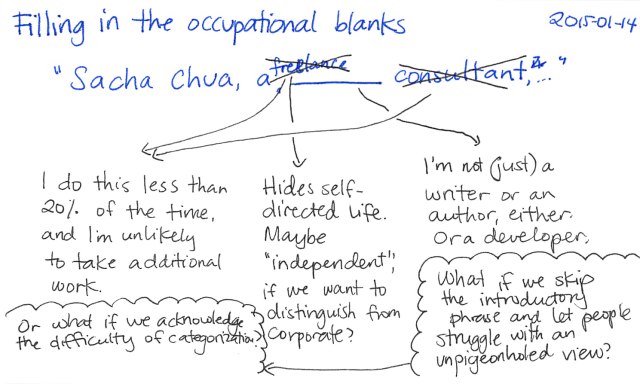 I can waffle by introducing several aspects, still within the vocabulary of regular occupations: a consultant and a writer, for example. I can say, “It’s complicated!” and explain my 5-year experiment, self-directed living, and learning/coding/writing/drawing/sharing. It might be interesting to play with no occupational categorization. Some context may be provided by age (31) – it’s common enough in newspapers and books. The editor might send it back with a question, “Yes, but what does she do?”, but there it is. I’m writing this on January 14 and posting this in the future (because I limit posts to one a day), so the article will likely be out by now. If I remember, I’ll update this with what he actually used. =) But I needed to think about it out loud, and I’m sure the situation will come up again in the future. Perhaps by then I’ll have a more compact way to describe myself. Leonardo di ser Piero da Vinci (15 April 1452 – 2 May 1519) was an Italian painter, sculptor, architect, musician, mathematician, engineer, inventor, anatomist, geologist, cartographer, botanist, and writer. Three or four nouns should be a good thing for me to strive for, eh? Even one or two nouns, if I can get to some level of distinction.